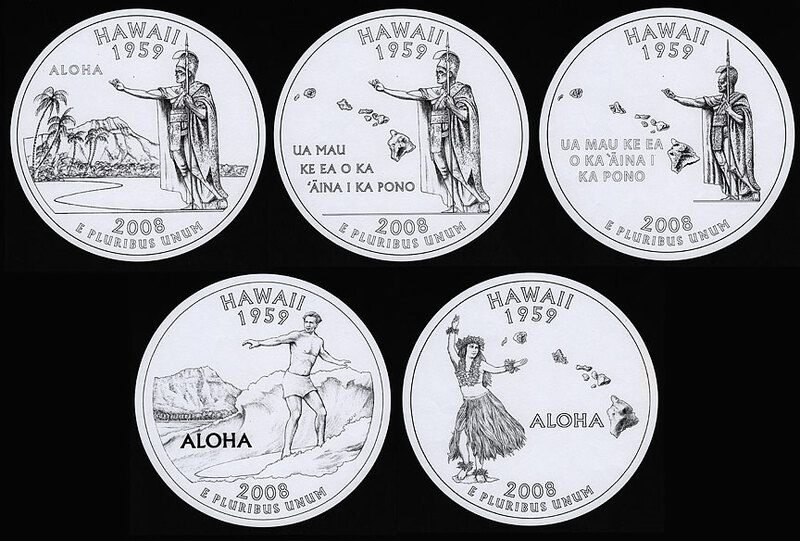 The design for Hawaii's commemorative quarter is likely to include a surfer, a hula dancer or King Kamehameha I. Members of the Hawaii Commemorative Quarter Advisory Commission selected five designs yesterday to be sent to the U.S. Mint. The designs will be sent to the U.S. Commission of Fine Arts, the Citizens Commemorative Coin Advisory Committee and U.S. Secretary of the Treasury for comments. Commission members in Hawaii will then rank the choices and give them to Gov. Linda Lingle, who will select the final design by mid-April. About half of the 36 commission members selected the five designs yesterday from 11 versions of the coin. One design is a surfer with Diamond Head in the background. Another is a hula dancer that features the Hawaiian island chain. The other three feature King Kamehameha -- one of the three designs includes Diamond Head, while the other two designs include the island chain and the state motto, "Ua Mau Ke Ea O Ka Aina I Ka Pono," which means "The life of the land is perpetuated in righteousness." Some commission members recommended minor changes to the Kamehameha designs yesterday, such as the placement of the words and the length of the line that Kamehameha stands on. Gregory Hunt, commission member who is also the president of the Hawaii State Numismatic Association and the Honolulu Coin Club, said he is leaning toward one of the King Kamehameha designs. Kamehameha is the reason why the islands are united, Hunt said, noting the motto is also special. Wendy Abe, president of the Honolulu Japanese Chamber of Commerce, expressed to Johnson and fellow commission members in yesterday's meeting that she also favors one of the Kamehameha designs. Sen. Fred Hemmings (R, Lanikai-Waimanalo), another commission member, supports the surfer design. Hemmings, a former world surfing champion who established professional surfing tournaments such as Pipeline Masters and Triple Crown of Surfing, said the surfer image is recognized worldwide and is the only activity endemic to ancient Hawaii. "It's important that the coin speaks to all the people of the world, not only now, but for future generations," he said. In February, Lingle established the Hawaii Commemorative Quarter Advisory Commission -- which comprises young students, residents and representatives from the neighbor islands and ethnic organizations -- to help develop concepts and themes for the state quarter, as well as to provide recommendations to her for the final design. Commission members submitted five written narratives to the U.S. Mint in August that best reflect Hawaii. Artists of the federal organization carried out their ideas. The commission is expected to meet sometime next month to discuss the selection process of the final design. The Hawaii commemorative quarter is the last to be minted through the "50 States Commemorative Coin Program." The program was created in 1997 to establish a new series of quarters to commemorate each state, according to Lingle's Web site. The Hawaii commemorative quarter will be in circulation in 2008.